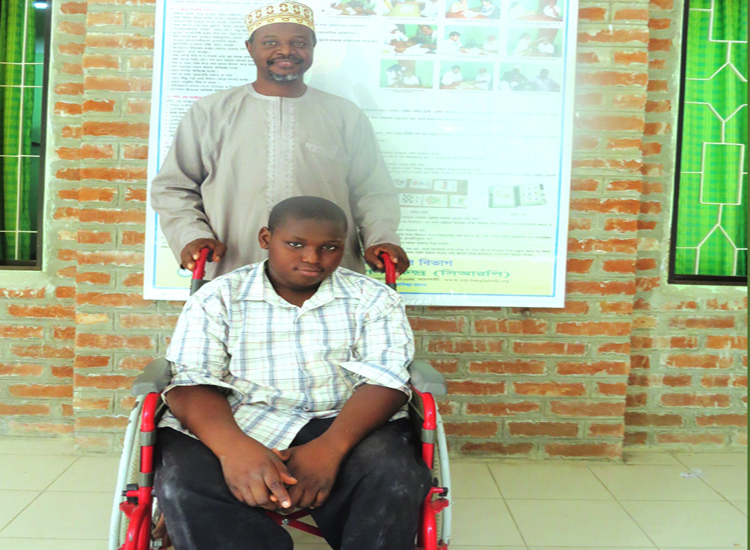 Mohammed, a fifteen year old boy from Nigeria has been incapable of walking since birth. Over the years, his father, Mr. Zafar, a civil engineer has taken Mohammed to a number of local physical and occupational therapists for treatment but ultimately learned that his son would require an asistive device to walk. Not sure of the Orthotic Hospitals available in Nigeria, Mr. Zafar sought assistance internationally. A Bangladeshi friend had told him of the incredible facilities at CRP and immediately Mr. Zafar resigned himself to take his son to the renowned center. Upon arriving at CRP, doctors identified that Mohammed had not only a fractured knee but had also an acute weakness in his waist, preventing him from being able to stand up. Mohammed has now enrolled in a one month physical and occupational therapy program using a wheelchair. Once he has built up enough strength, CRP’s Orthotics Department will fit him with a special mobility device that will assist him to walk. Since arriving at CRP, Mohammed’s condition has improved rapidly and he is often found participating in sports in Redway Hall and practicing his shooting skills out on the basketball court. Both Mohammed and his father Mr. Zafar are extremely thankful that the treatment provided by CRP has been going so well and have said how much they wished their own country had a similar sort of center. They are in the process of planning their trip back to Nigeria where Mohammed will return to his studies and rejoin his classmates.